Fr Spadaro examines the reason why we should not use such devices (see: Si può celebrare la messa con l’iPad?) The New Zealand Bishops' Conference argues that faiths have sacred books and that the physical form of the Missal is an indicator of its special role in our worship. That is a good point, especially now that we have much more worthy books produced for the new ICEL translation. Fr Spadaro extends this to make a point in linguistic philosophy which I think might be on rather shakier ground. He says that with electronic devices, the text becomes a fluid object, the exact opposite of the "tablets of the law" and of "scripta manent". I'm not so sure about that. As the saying goes "an email is for ever": what is posted on the internet can be very permanent. On the internet, the authenticity of texts is also guaranteed more firmly because of the enormous number of people available to correct mistakes, either informally by commenting in the social media, or formally by taking part in crowd-sourced projects. I remember many years ago, the learned Fr Orbe speaking to us of some of the texts of the Fathers in a new edition. He said in his soft and high-pitched Spanish-accented Italian "There are errors; typographical errors; but still they are errors." He pointed out that they were the modern equivalent of copyists' errors in manuscripts. Those were the days before the availability of electronic tools that enable vast amounts of text to be compared and corrected much more rapidly than before. The Liturgy is therefore a bastion of "resistance" of the text-page relationship against the violation of the text, disincarnated from the ink on the page, the context in which the page remains the "body" of a text. Again I am not sure I would go along with him there. After all, as he acknowledges, the Council of Trent embraced the modern technology of its time which was the printing press and used it precisely in order to standardise the text. For most of the centuries of Christianity we have not had printed books. 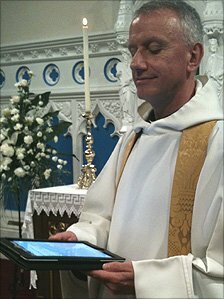 Let me be clear, I do not think that priests should use iPads to celebrate Mass, they should use proper Missals. However tablet and e-reader technology is in its infancy and we simply don't know how it will develop within the next five years, let alone the next fifty. The process by which books are printed has changed radically since the Council of Trent; the manner in which a text is placed before us has changed before many times and will change. Our present tablets and e-readers will be laughed at as primitive early devices in the not too distant future. It may well be that something more suitable for sacred worship could emerge. If you are personally wondering whether it is good to use a smartphone or tablet to follow Mass, I'd advise some caution. The screen as a light source in itself can be distracting to others so it would be good to be as discreet as possible, (though I know that the Liber app is a boon for singers.) E-book readers are probably much more suitable: which itself illustrates the way that things can change.